PDF Submission Service in Bangladesh. 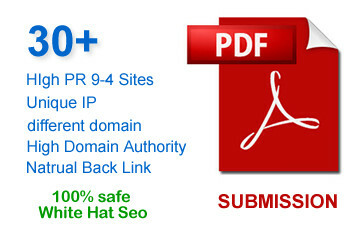 We Will Manually Submit Your PDF to 35 High PageRank (PR9 to PR4) Document Sharing Sites With Affordable Price. PDF (Portable Document Format) submission is the process of sharing your PDF file to different document sharing websites to get high quality targeted traffic to your website. It is also a very popular medium of online marketing. Usually companies submit their profiles, brochures, articles, press releases to different high traffic and Page Rank document sharing websites to get online exposures and clients. Many people do not realize that search engines are now able to crawl/read the content of doc or PDF files. And this is why PDF submission is now one of the most powerful and effective off page search engine optimization techniques. Since domain authority and page rank of most of the old document sharing websites are very high, links from these websites are very powerful. If your PDF/document is well written for readers and optimized for search engines then you will see very fast result in your traffic and search engine rank positions (SERPs). But you must have a clickable hyperlink in your pdf/document to get the link back to your website from those high PR document sharing websites. Manually Done: We will manually upload your pdf/document file. 35 Website Submissions: We will submit your pdf file to top 35 unique document sharing websites. KeepAndShare – PR6 And another 28 high PR document sharing websites. Non-English Language: Your document can be in any language but hyperlink must be in English. .PDF or .DOC: You can submit either .pdf file or .doc file and we will convert it to proper document format for the submission. DoFollow-NoFollow Mix: To keep all backlinks natural & SEO friendly we will create some do-follow & some no-follow backlinks. Detail Report: Complete report will be provided in excel sheet (with live links). Turnaround Time: Total job will be done within 10 days. Provide Document: You must provide us your pdf/document file or you can order us to create a pdf file for you. 300+ Words: Your pdf/document must have minimum 300+ words. But we recommend 500+ words with minimum 2 related images. Not More Than 3 Links: For better SEO result do not include more than 3 hyperlinks in your document. 2 back links are recommended. URL: You must provide your website URL or ULR that you want to promote. Title: You need to provide a title for your document/pdf. Description: You need to provide a short description for your document. Keyword: Please do not forge to provide us keyword. 3-5 keywords work best. No Adult Content: We do not accept ADULT, GAMBLING or PHARMA websites. So please don’t order for those types of websites. Mix of Do-Follow & No-Follow Backlinks.